Two MIT cognitive scientists, working in the 1960s, showed that seeing the world around you was not enough to understand how it works. You had to actually experience that world to learn how to operate in it. They did this by raising cats in total darkness to control the relationship between seeing and learning. Once a pair of kittens were old enough to walk, they were placed in a lighted box for three hours a day. In the box was a kind of carousel, with each kitten placed in a harness. One of the cat’s legs reached the floor, and its walking movements made the carousel move in a circle. The other cat’s legs were restrained by the harness. It could see everything going on – the movement, the other cat walking around in circles – but its legs never touched the floor. It had no active control over the carousel. After eight weeks of daily carousel walks the cats were brought into the real light-filled world to test what they had learned. They were tested to see if they’d automatically place their paws on a surface they were about to be set down upon. And if they’d avoid a steep ledge, walking around to a gradual ramp instead. And whether they’d blink when an object was quickly brought close to their face. 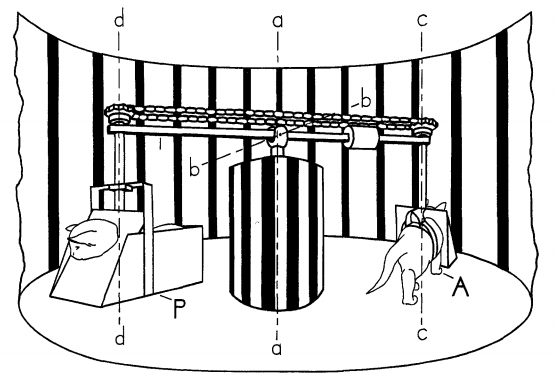 100% of the cats whose legs had control over the carousel’s movements tested normal. The cats who only watched, but never controlled, the carousel were functionally blind. They bounded towards the steep ledge and fell straight off. They didn’t put their paws out to land on a surface. They didn’t blink when an object accelerated toward their face. It wasn’t that they couldn’t operate their bodies – they learned to do that in the dark room they were raised in. But they couldn’t associate visual objects with what their bodies were supposed to do. The two cats grew up seeing the same thing. But one experienced the real world while the other merely saw it. The result was that one was normal; the other was effectively blind. If you want to learn something, dive right in and do it. Don't just read about it. Don't just watch videos. Don't just listen to lectures. But also do it. If you are learning how to swim or how to code or how to drive a car, you are taught by being asked to do it while someone watches over and guides you. You aren't given hundreds of minutes of lectures and videos. Yet, in most of the real world things we pursue, we refrain from actually doing the thing and try to learn by watching and observing instead. I've learnt new languages when I've been forced to speak it or watch movies in it. I've learnt how to take good product decisions by doing it. I've learnt how to work with different kinds of people by doing it. Sure, learning by observing gives us a platform to do it that little bit better the first time. But by the second time, that edge will be all but nothing between someone who dived right in and did it for the first time without having spent hours and hours observing. Tim Ferris advocates for a way of life that involves frequent experimentation where he tries out new things for a few weeks or a few months and then learns from it and decides whether to continue on and get better at it or to give up and try his hand at something else. And I've been following the same way of life these past few years where I've been diving right in and doing new things which I wouldn't even have dreamed of doing had I simply spent time observing and learning as I would never feel I'm ready. Through such experimentation, I've published a book, I've performed stand-up comedy in front of hundreds of strangers (and made them laugh), I've started The 0.7 Club and I've learnt how to cook dishes spanning cuisines from seven different parts of the world. If you have spent the first fifteen weeks deliberating on whether you are good enough to start or whether the output would be good enough if you do it right away, if you are wondering whether you are ready, I urge you to just dive in and start doing it. Or you'll be like the functionally blind cat. Speaking of the cats, when the study was over, the blind cats were left in a fully lit room. Forty-eight hours later, all were effectively normal, regaining their “vision” and learning how to match the world around them to their movements. Eight weeks of seeing their world taught them virtually nothing. Two days of experiencing it, and they had it all figured out. You decide which path is better.